- When I was eight I developed a huge crush on Chad Allen, who played David Witherspoon on Our House. The focus of my diaries from 1986-1988 was on the names of the children I planned to have with Chad once we'd met, fallen in love, and married. - When I was 17 I was completely obsessed with gymnast Shannon Miller and the United States Women's Gymnastics Team, better know as the Magnificent 7 and for their team gold metal victory in the 1996 Atlanta Olympics. I spent my Saturday nights making scrapbooks of newspaper articles in which these gymnasts were mentioned. - When I was 18 I fell in love with the movie Titanic and it's star, Leonardo DiCaprio. I'd always been intrigued by the story of the Titanic and a fan of Leo (thanks, Growing Pains), but when they came together in the blockbuster of the decade I was beside myself. I saw the movie nine times in the theater and wore out my video cassette. - Throughout high school and college I was a huge Friends fan. I never got the "Rachel" hair cut, but I followed the show religiously and threw regular Thursday night Friends-watching parties. 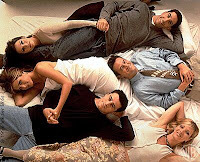 And my friends and I may have taken pictures of ourselves in this Friends pose. So I guess it was about time for another obsession - something interesting and thought-provoking with large doses of adventure and danger and romance thrown in - to find its way into my life. The Hunger Games trilogy turned out to be exactly what I didn't know I needed, and it arrived on my doorstep when there was finally room in my life for a distraction. My newest obsession is The Hunger Games. Yes, I realize I'm more than a little late to this party. But with the exception of the Rascal Flatts, who I loved from the very moment their first single hit the airwaves, I have ALWAYS been a little late to the party. Email? A ridiculous way to communicate. It's never going to catch on. Cell phones? A waste of money. There's a pay phone two blocks up and four blocks over that I can use any time I want. I've eaten my words more often than I'd like to admit, especially with regard to technological developments and entertainment trends. So it makes sense - if you consider my history of loving, appreciating, taking advantage of, or buying whatever everyone else loved, appreciated, took advantage of, or bought six months previously when the buzz first began - that I'd just now be jumping on the Hunger Games band wagon. Though the first book in the trilogy (in case you've been living under a literary rock, as I was, the series includes The Hunger Games, Catching Fire, and Mockingjay) was released in 2008, I hadn't heard of the series until earlier this year when The Hunger Games movie trailer was released. Friends and acquaintances who'd read the books described them as interesting, engrossing, and even amazing...young adult fiction. The last books I'd heard described as young adult fiction were those in the Twilight series. I tried to read the first Twilight book and watch the first Twilight movie (were they both called Twilight? I have no idea), but both made me want to jam a pencil into my eye. I still ponder what I could have done with the hour I lost watching Edward and Bella sulk around their dreary high school cafeteria. Probably something amazing. Like laundry. Not to mention the fact that I'm 33, people. I can't be seen reading young adult fiction (which in my head = Sweet Valley High and The Babysitters' Club) during Will's baseball practices or on the treadmill at the gym. So when I heard The Hunger Games described as young adult fiction I made a decision - the wrongest of wrong decisions - to avoid all things hungry and game-related. Since I've gone on for quite a while now, I think I'll go ahead and split this one post into two. Tune in tomorrow, when I'll share 1) how I came to obsess over this fantastic series, 2) how my children barely survived my obsession, and 3) a whole bunch of pictures of me and my SIL embarrassing ourselves with pretend bows and arrows. next watch the wire. trust me.